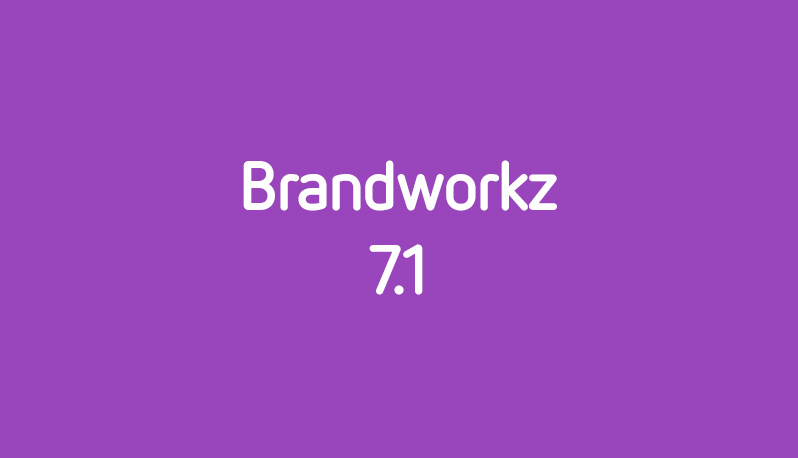 Brandworkz, the brand management software and digital asset management software company has today launched software version 7.1 with significant improvements to search, infrastructure and reliability. Major infrastructure improvements as Brandworkz moves hosting to Amazon Web Services. Other improvements and fixes such as stability improvements on the core DAM functions of upload, download and zipping. “Our focus at Brandworkz is on delivering the most intuitive and user-friendly brand management platform on the market. This release is helping us realise that objective. Our new Search is one of the fastest and most reliable available. We’ve taken time to really understand the structure of our clients’ data. We worked with search experts to make the feature as quick as Google and as instinctive as e-commerce sites, something users have come to expect in a digital asset management system. Our move to Amazon Web Services is also significant, enabling auto-scaling, elastic scalability and speed.” says Hari Walters, Head of Product at Brandworkz. The overhaul of Search has created a feature that is one of the fastest on the market and has an automatic filter display (also known as facets) that will never leave the user without results. Search results are shown as words are typed: the system will predict what is being typed and show results for that word. As the word is typed further, the results update instantly. Similar to e-commerce sites, when searching for an item such as ‘shirts’, different filters relating to this are available. When a particular type such as ‘t-shirts’ is selected, the system will update the counts on the filters, and remove those no longer available. Therefore the system will only show options leading to actual results or assets, giving users more successful searches. If assets are tagged with multiple choice fields, filters for these will automatically show on the search results page. Admins can configure the search options for each field to decide how the search filters display for end-users. As keywords are typed, the matching words are highlighted in the asset titles. The move to our new hosting provider, Amazon Web Services (AWS), has been done for security, stability and scalability reasons. Speed: AWS has servers located in multiple locations all over the world. The servers are up-to-date, robust and powerful so they offer a faster overall experience when using a Brandworkz site. There is less latency so uploads, downloads and page loading happen quicker. Reliability: New servers can be booted up with only a few minutes notice, so if a server goes down, there can be a replacement up and running within minutes. Elastic scalability: With AWS, the servers detect the traffic on a Brandworkz site at any current time, and will automatically scale up the servers, ram and CPU to deal efficiently with the traffic peaks. There are stability improvements around file upload, download and zipping – especially files containing non-alphanumeric characters like symbols and non-roman characters. There is improved notification to end-users when transforming a batch of assets for download. Additional user information is available on the Viewed Assets report. Content uploaded to a Brandworkz instance can have an embargo date set, before which the folder and its contents cannot be seen. Mandatory fields with missing data are now highlighted in red. The look and feel of the bulk edit metadata page is improved with large previews of the assets and a full screen grid showing each of the metadata fields. It is now possible to add metadata to multiple assets uploaded as part of a workflow stage. Mail-merge entries can be added in the default text of a field which will populate at the time of upload with the current user or uploader’s registered details. Additional API calls have been added so even more of Brandworkz is accessible for integrations with other systems. These calls are currently being used by one of our clients in an iPad app used by sales teams for accessing albums and user information on the go. There is now additional information such as details on the user who viewed the asset, when the ‘Used Asset’ report is downloaded to Excel. Setting up groups in the system with similar permissions to existing groups is easier. Existing groups can be duplicated and configured as new ones. Ultimately the platform enables every internal team within a business to deliver a unified brand experience. It allows users to share marketing content, create and edit artwork, collaborate with colleagues globally and buy in to the brand promise.